When Chris, the editor here at SEGA Nerds, asked me if I’d like to write a retrospective, I began brainstorming which game I’d most want to cover. For me, the Dreamcast is the best era of SEGA gaming, so I knew it had to be a game from the life cycle of that sadly short-lived console. There’s been a lot written about the amazing experiences found in games like Jet Grind Radio, Shenmue and Sonic Adventure. My Dreamcast collection is so packed full of fantastic titles that I could almost write a book, but even with this embarrassment of riches it didn’t take me long to decide which game to write about. The game is the venerable Japanese RPG Skies of Arcadia. 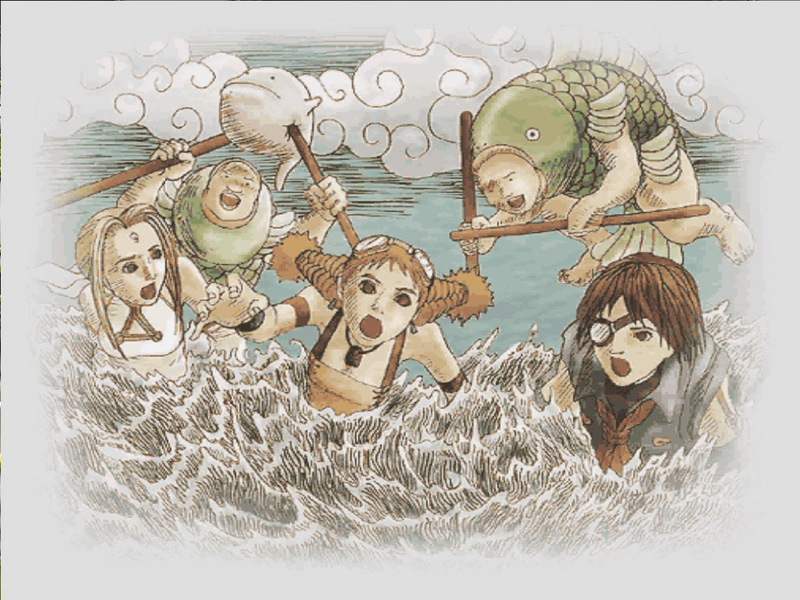 Skies of Arcadia is not just a well-crafted entertainment experience; to me, it’s much more important than that. For those of us writing for and visiting SEGA Nerds, video games are a hobby. As a community we feel about video games much the same way that others might feel of photography, motorcycles, or tennis. They are a pastime, an outlet, a way to share experiences with like-minded people. Among other things, they let us relax, compete with others, and sometimes show us things we’ve never seen before. The best examples of the games we love have the ability to help us through difficult times, transport us to a happier place, and can even change our lives. For me, Skies did all these things. At the time of its release SoA looked incredible. The game was a fantastic display of what the Dreamcast was capable of at the system’s one year anniversary (2 years old in Japan). Here was a massive, open-world game, dripping with amazing graphics and special effects, and packed to bursting with rich characters engaged in deep and emotional storylines. Indeed, the game was so packed to bursting that it could only be contained by the use of two Dreamcast GD-ROMs, one of the few multi-disc Dreamcast games. And while stunning visuals, great music and richly written characters are all hugely important parts that make up a quality video game, it’s those special games that become more than the sum of their parts that we tend to remember decades later. This is the case with the Dreamcast’s best RPG. Oh yes, the real beauty of Skies is more than just skin deep. Skies’ strongest asset is the spirit of optimism that its creators imbued in every facet of the game. While it’s easy to forget, video games are created by a group of people, and the decisions these people make in its creation directly influence the way the game will turn out. When you play Skies you can really feel the presence of its creators, and it’s clear from the opening cutscene that they set out to create a game that would make the player feel good. Bad things may happen, but there is an overwhelming sense of joy and optimism in every story arc, in every battle, in every difficulty faced by its characters and overcome by the player. In a year 2000 interview with IGN, Overworks head-honchos talked a bit about this philosophy, saying “…we wanted to go for that sense of high adventure morale feeling. To get this across, all of the expressions are made big.” This refreshing positivity is something that’s almost completely missing in today’s Triple-A games, and this is a terrible thing. 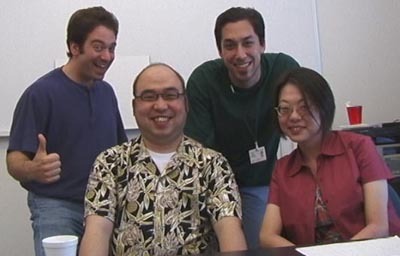 To give credit where credit is due, Skies was made by an internal SEGA development house called Overworks (formerly AM7), and consisted of a veritable dream team of SEGA talent. With veteran game-makers Shunto Tanaka (writer/director) and Reiko Kodama (producer), and music makers Yutake Minobe and Tatsuyuki Maeda, Overworks wielded a collective of talent whose members’ previous works included such amazing titles as the Phantasy Star series, Dragon Force, Magic Knight Rayearth and Panzer Dragoon Saga. Additional work was done by Sega America’s Chris Lucich, who was responsible for Skies’ final western script and previously subtitled Panzer Dragoon Saga. With these RPG credentials behind them they set out to develop what was then known as Project Ares, in 1998. After years of development, polishing, and careful attention, the game was ready. It would be called Skies of Arcadia in the western world, and Eternal Arcadia in Japan. But whatever name you know it by, Skies is one of the best and most polished RPG’s of its era. Released in late 2000 in Japan and North America, and in April 2001 in Europe, Skies would be the final RPG developed by an internal Sega studio for a Sega video game console. Only Phantasy Star Online would follow, and this by only a couple of months (and predates Skies in Europe). But with Phantasy Star Online’s relative lack of traditional JRPG elements one can conclude that Skies of Arcadia is Sega’s final, traditional JRPG for a Sega console. 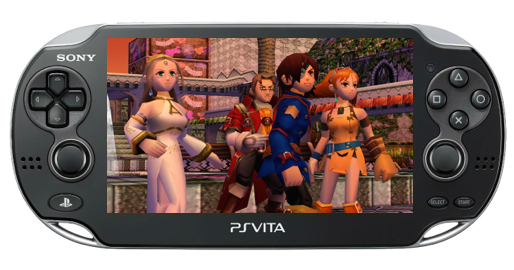 It would also be one of only two major JRPGs for the system, the other being Grandia 2. The European, North American, and Japanese box art. At the time of its release its difficult to emphasize what a big deal this game was. Official Dreamcast Magazine said that Skies of Arcadia was “set to become everything to Dreamcast that Panzer Dragoon Saga was to Saturn. Yes, it’s that big.” EGM rated the game at 9.5, 9.0, and 9.5 and awarded it Game of the Month. 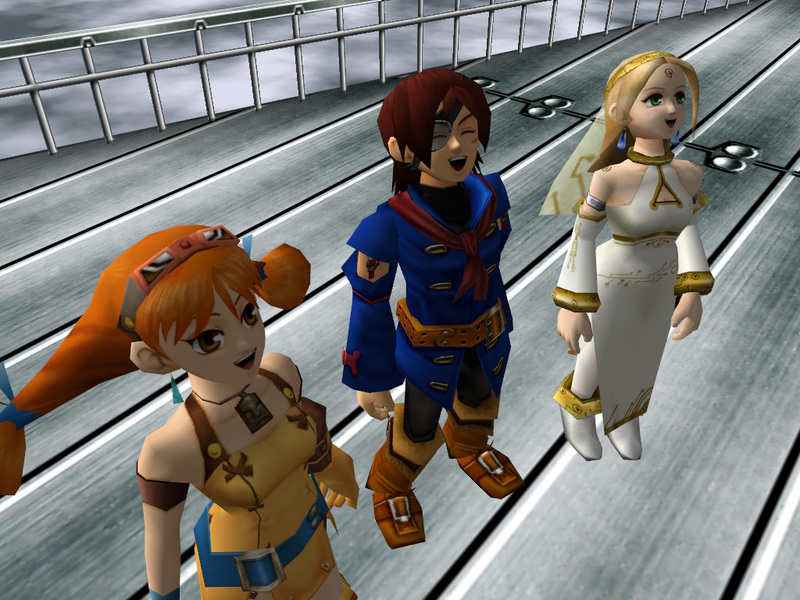 IGN gave it a 9.2 and awarded it with its Editor’s Choice award, saying “Skies of Arcadia is not just one of the most beautiful Dreamcast games to play, but one of the most addicting RPG I’ve played in years.” Indeed the hype and accolades surrounding this game were immense, and more than a decade later the luster has not faded a bit. The game is set against a compelling backdrop of neo-mysticism and ancient technological weaponry, similar to the Panzer Dragoon series. In the mythos of the game, the world of Arcadia is an ancient place in which continents float in a vast “ocean” of air and clouds. Thousands of years before the start of the game, the world was shared by six highly advanced civilizations. These civilizations existed on floating continents among the sky, and each worshipped their own specific moon, of which there were also six. As the decades passed the civilization’s technologies advanced. Massive skyships were built to fly across the vast expanses of air. Exploration, trading, and exposure to each other’s cultures brought on disagreements and competition for resources. Armor, weapons, and eventually warships were developed. The civilizations began to squabble and an arms race ensued. In time, each would harness the power of their respective moons to create the Gigas, gigantic living weapons of mass destruction which were controlled by six mystical meteorites called Moon Crystals. The civilizations grew resentful and distrustful of one another until inevitably the Gigas were let loose to fulfill their ultimate purpose. The six civilizations waged a devastating war, each attacking the others, causing enormous environmental damage that threatened the existence of all six civilizations. The Gigas, controlled at first by the Moon Crystals, broke free of their controllers and raged out of control. Seeing intervention was necessary, the most advanced of Arcadia’s civilizations, the Silvites, used their Giga to bring on the Rains of Destruction, which stopped the rampaging Gigas by crashing meteorites down on them. Collateral damage was massive, and the civilizations would not return to their former strength for thousands of years, but the war was ended. A seal was placed on the Silver Gigas to ensure the Rains of Destruction would never be used again, and the Moon Crystals that controlled the Gigas were hidden. This Giga is about to go bonkers. At the opening of the game the Moon Crystals have remained safely hidden for thousands of years, but their legend has lived on, along with the legend of the massive power the Crystals control. Seeking this powerful weapon, the militant and tyrannical Valuan Empire criss-crosses the skies, laying waste to whoever stands in the way of their prize. Knowing this, the Silvites, last protectors of the Moon Crystals, have sent a girl named Fina to find and retrieve the crystals before the Valuans. Unfortunately, She is quickly overpowered and captured by one of Valua’s admirals. While Valua is powerful, they aren’t invincible, and are opposed at every opportunity by an assemblage of air pirates. One such group, the Blue Rogues, holds within their ranks a couple of kids, a boy named Vyse and a girl named Aika, who witness Fina’s ship being attacked and overtaken by the Valuan fleet. Without hesitation they resolve to rescue the girl by attacking and boarding the massive warship. After the rescue, Fina confides in Vyse and Aika that she has a secret mission to regain the Moon Crystals before the Valuans. Vyse and Aika promise that they’ll help her every step of the way, and the adventure begins. While the smallfry-versus-empire story isn’t the most original, it’s the progression of the characters’ individual paths that makes it powerful. Overworks was careful to give each and every character a unique and compelling reason for existing. Even characters who figure into the story in the tiniest way are fully fleshed out. It gives the world a real sense of weight, and it was a brilliant move by the team at Overworks. From the very first cutscene the game is dripping with a spirit of adventure and positivity mentioned previously. The first time the player meets Vyse, the main character, he’s quipping to a group of highly trained Valuan soldiers that they’re about to lose all their valuables! Seconds later, Aika drops in from the sky and chirps that she can’t let Vyse have all the fun! The two 17-year-old pirates are skilled, daring, and cocky, perfect qualities for JRPG heroes. 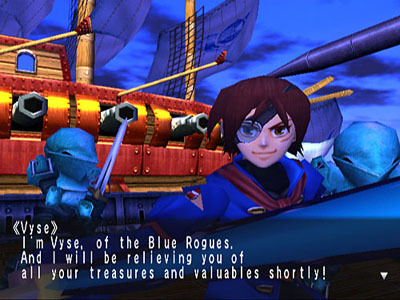 Supplementing the written dialogue of the lovable rogues is the fact that Skies of Arcadia was one of the first games to have dynamic facial expressions on its in-game models, and during these scenes there are continuous flashes of wry smiles, winks, and mischievous grins throughout. 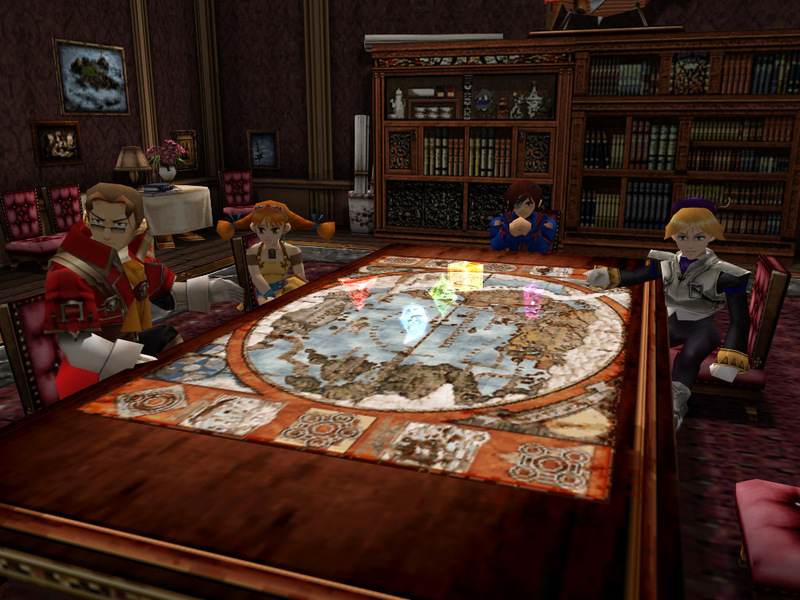 As the story progresses the trio of Vyse, Aika, and Fina quickly expands through the meeting and allying of a whole subset of secondary playable characters. 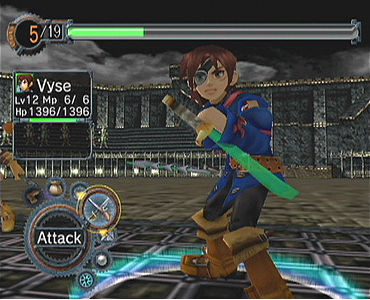 Throughout the game the battle system retains a four-person party system which consists of Vyse, Aika, Fina, and one alternating secondary character. Which character is in the party at any given moment is largely dependent on the progression of the main story arc, but at times the fourth member is selectable at will. 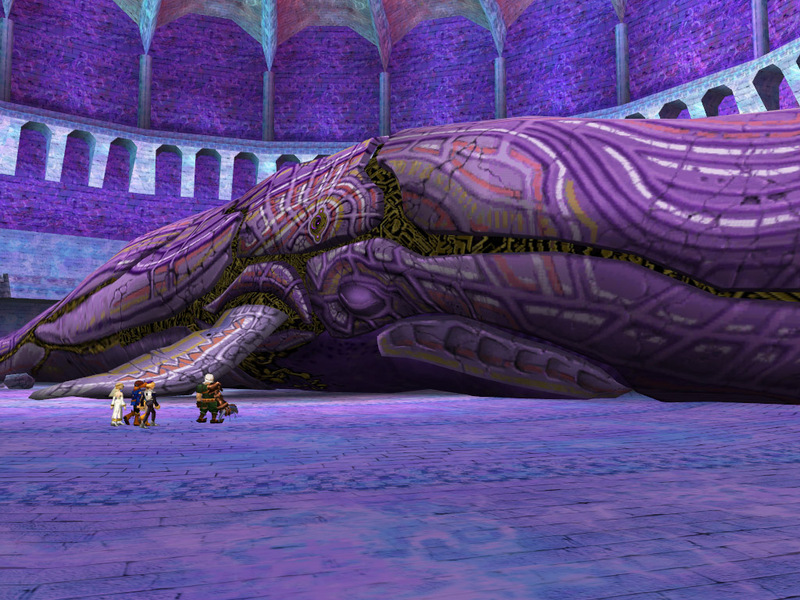 The crew encounters the arcwhale. Often secondary RPG characters are one-dimensional husks of little interest. Not so here. The secondary characters are some of the games strongest personalities. The first of these is Drachma, a 55 year old fisherman who lost his arm, eye, and son while battling a giant arcwhale named Rhaknam. 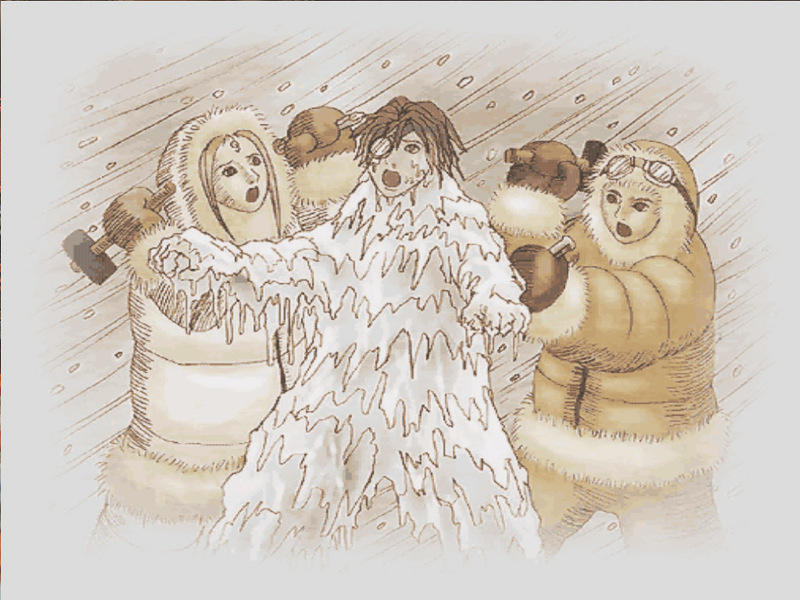 Through a series of events he is thrown in with Vyse and Aika and reluctantly agrees to travel with them for a time. 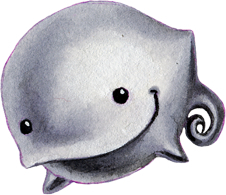 His Ahab-esque obsession with finding and killing the arcwhale leads him to branch away from the main group, but his story is not finished, and he plays a pivotal role in the outcome of the game. Gilder is another secondary protagonist. He’s a 32 year old ladies man who is mostly interested in having fun. He joins Vyse after rescuing the stranded boy from a certain island. He’s the most roguish of the game’s heroes, but he has a strong moral compass in the end. Gilder fights with a pair of pistols and wears a stylish pair of glasses. His story includes a recurring gag in which he must flee from a pirate named Clara, a woman obsessed with him. The final secondary character is Enrique, a 25-year-old Prince of Valua. He can’t tolerate the despotic rule of his family and their Valuan Empire. He is one of the truest members of the party, and only through his help are Vyse, Aika, and Fina able to complete their mission. It is through Enrique that Vyse is able to secure a flagship, the Delphinus, a massive warship he uses against the Valuan Armada. 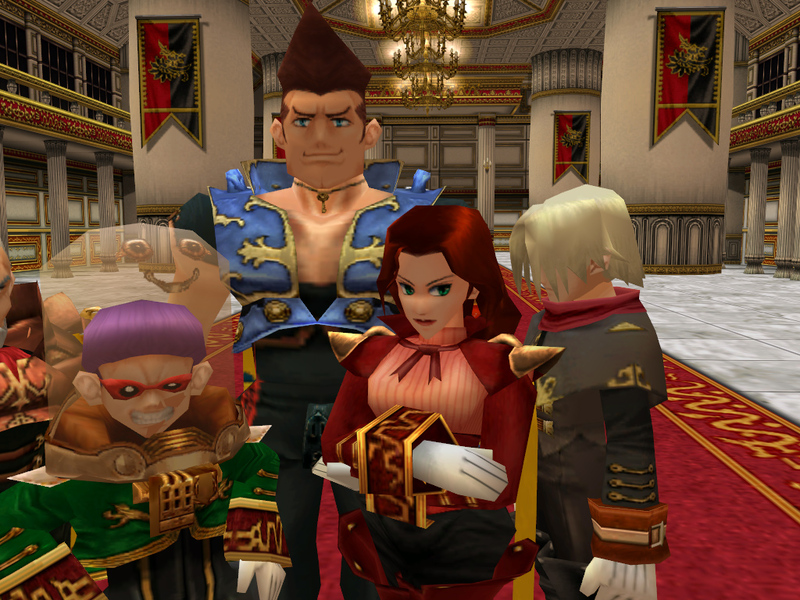 Some of the villains of the skies that Vyse and crew battle. As a counterpoint to the strong protagonists, there exists a malevolent band of bad guys. A collection of Valuan Admirals, their personalities are strongly written, and run the gamut from darkly sinister, to laughably oafish. Each has their own distinct style, which helps to add variety and nuance to the enemy threat. The sultry Belleza is memorable for her flirtatious demeanor, and similarly memorable is the bumbling genius De Loco, who’s constantly throwing hilarious tantrums when things don’t go exactly to plan- courtesy of the Blue Rogues. Throughout the game these Admirals try there best to thwart the Blue Rogues, and often try to thwart each other in hopes of promotion. The infighting clearly demonstrates the callous selfishness of the Valuan armada en masse. Overworks decided that the Valuan empire didn’t deliver enough nemeses for the three heroes, and ingeniously included a secondary cast of adversarial pirate groups. These enemy pirates are out for their own ends, be they gold, glory, or a finely roasted ham. These lesser adversaries are encountered throughout the course of the adventure and add an incredible variety to the game’s pacing, battles, and story arcs. Some of these rivalries can be missed in the normal course of play, and only through thorough exploration of the game’s massive overworld will the player fully experience all of the challenges Overworks packed into their creation. 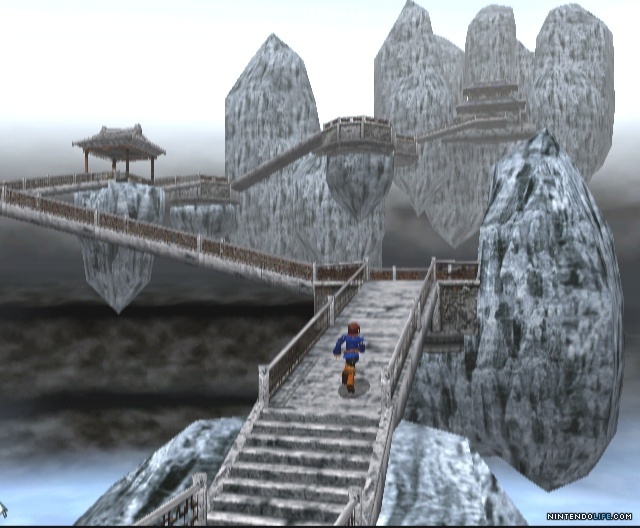 The gameplay of Skies is very similar to many classic JRPGs, with a few important wrinkles. Exploration is key, so the game world is made up of a huge collection of islands for the player to explore. Some of these islands are very small and some are absolutely massive. No matter the size they all offer unique and interesting additions to the overall experience. Whether these experiences are simply fleshing out some trivial details of the inhabitants of the world, or leading you to the discovery and capture of another of the all-important Moon Crystals, each island is unique and well-crafted. In fact, the whole world of Arcadia is so well-built that it’s difficult to think of another game that so effectively conveys the vastness of the world, the thrill of exploration, and the joy of discovery better than this game. Exploration and dungeon crawls are done (mostly) on foot. 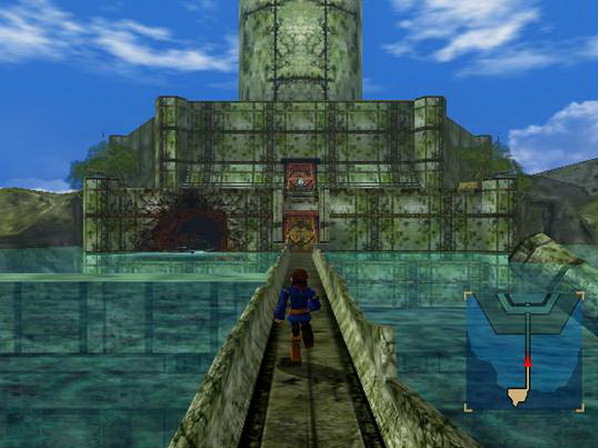 When Vyse and company have landed on an island the exploration is done on foot, similar to many RPGs. The player explores the island and interacts with the people found there, often learning details that flesh out the overarching story or add to the island’s unique place in the world. On many of the larger continents the player will encounter the game’s dungeons, where the main narrative is pushed forward. 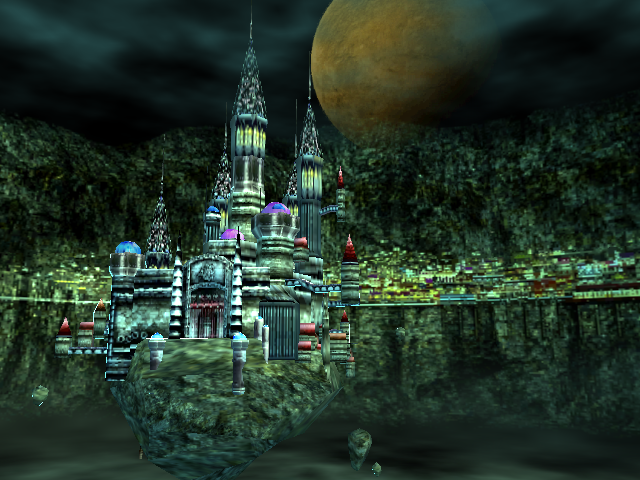 The usual progression is that the group has learned the location of Moon Crystal and is pushing through a temple or ruin to find it and retrieve it. During these dungeon-crawls the player will rather frequently encounter random battles. When dropped into combat the game uses a turn-based system that JRPG fans will be very familiar with. All the usual options are here: Run, Items, Guard, Attack, S.Move, Magic, and Focus. For each combat round the player chooses an action for each character, after which the round commences. Enemies and player characters take turns dealing damage, healing, etc., and when the battle is over experience, items, and cash are awarded. 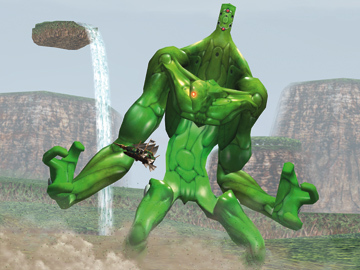 Additionally enemies will sometimes be week to certain elements, and the player can change the party members’ weapons to be more effective against individual enemies. This is pretty standard stuff. The party battle system is standard JRPG far, well-executed. 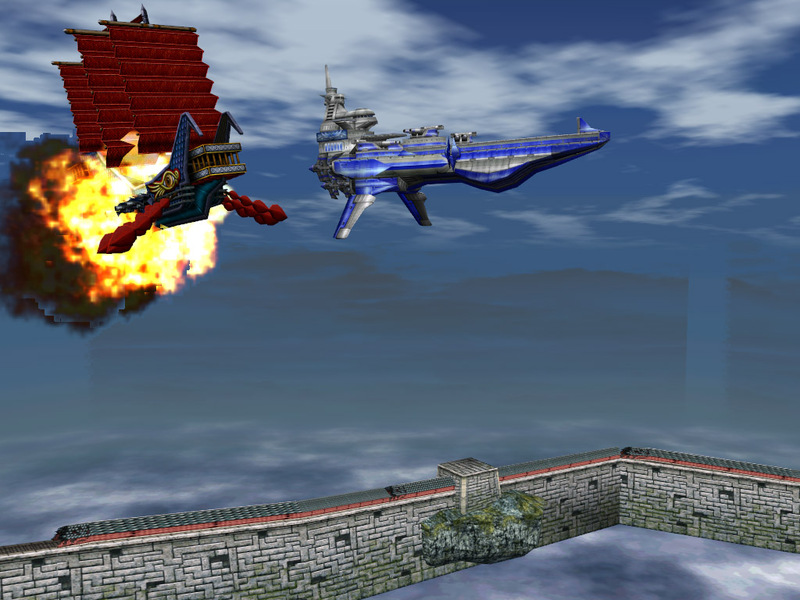 While the combat is solid and engaging, the more interesting battle system occurs outside of the dungeon crawl, when the player is out exploring the skies in one of the game’s controllable flying ships. During this flying over-world exploration there are two types of random encounters: those in which the battle occurs on the deck of the players craft, and those in which the player and crew are directly battling another flying airship. The deck battles are identical to the dungeon battles, and add some variety to the over world. But it’s the battles between airships that are truly fantastic. You’ll come up against numerous rival pirates from all over Arcadia, and Valuan warships. 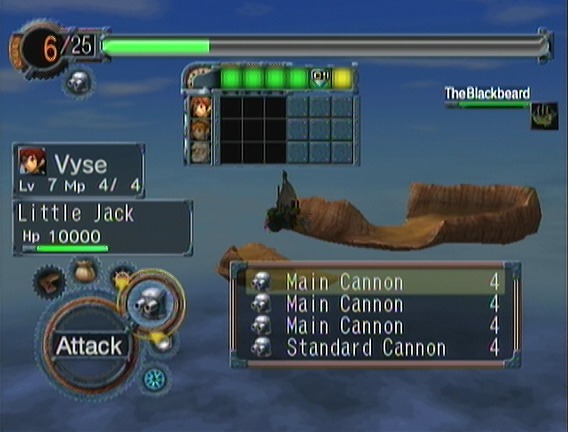 These battles require a good deal of strategy, patience, and skill, and are one of Skies of Arcadia’s strongest points. Ship battles are conducted in the same turn-based style as the on-foot combat. The player uses a grid to determine which ship in the battle has a tactical advantage based on positioning. The player then selects actions depending on the outlook of the round. 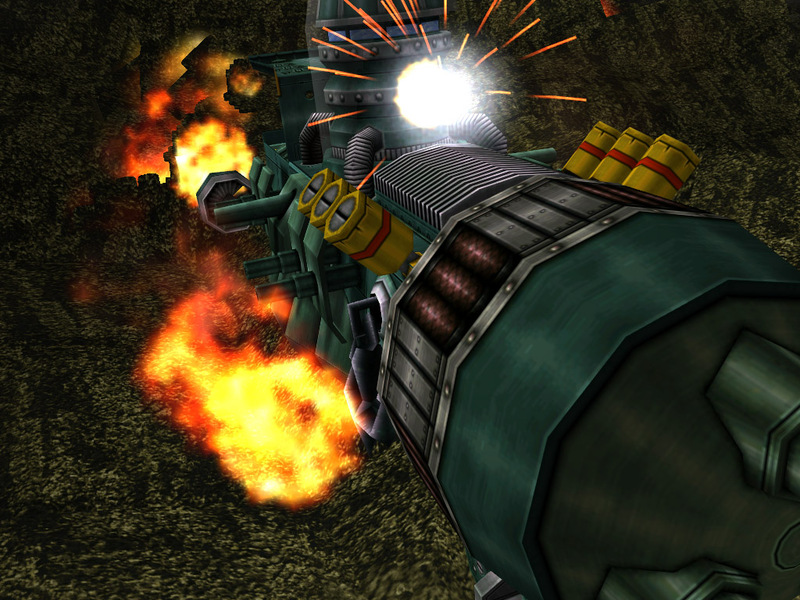 Attacks are made using cannons that can be chosen by the player. Some of these include powerful main guns, multi-firing secondary weapons, or delay-effect torpedoes. By using a variety of attack options, players can stack effects and hit points to do devastating damage. Magic attacks are also available, as are healing kits and mechanical boosters. 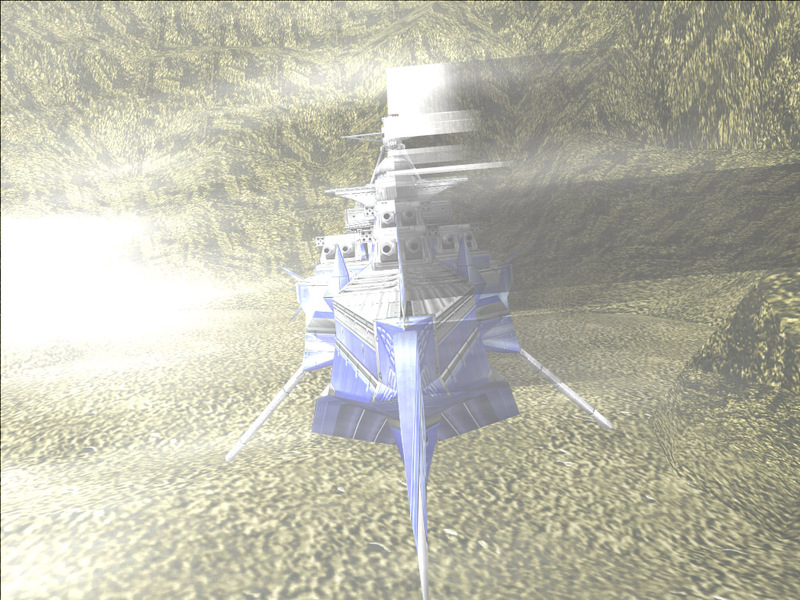 Super Moves in ship mode reveals a rather incredible forward facing cannon or harpoon, depending on which ship the player is controlling. These are extremely useful when facing off against the ancient Gigas during key battles in the main story. Skies’ ship combat is deep and engaging, and some battles can take over an hour. To further develop the ship, the player can build a unique crew by meeting and talking to various colorful characters throughout the world. 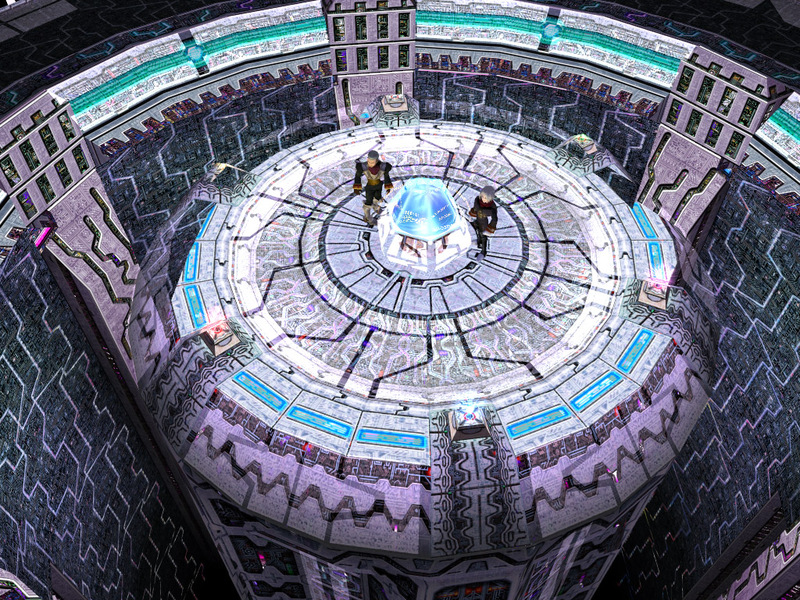 Each member adds unique and interesting qualities to the overall statistics of the ship, and can be called upon during battle to utilize that individual’s special abilities. It’s not all battling and destruction though. When exploring the over world in an airship, the player will stumble upon legendary relics, ruins, and strange occurrences in the world. These are called “Discoveries” and are hidden everywhere. Details about the discoveries the player makes can be sold at the Sailor’s Guild in various towns throughout the world. These discoveries yield massive amounts of cash, which can be used to purchase the usual RPG items- consumables, weaponry, armor, ship parts. Beyond their in-game value, the discoveries add depth to the mythos of the game and are worth seeking for their often clever descriptions, and the level of attention that clearly went in to creating them. Some of the Discovery logs the player collects as he explores. 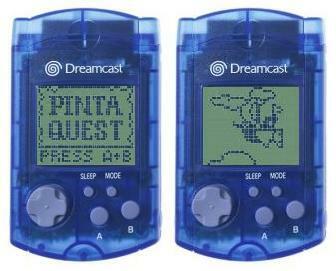 The VMU game Pinta’s Quest was a great way to earn cash and items in Skies. Furthering the theme of exploration is the sheer variety of experiences encountered when flying from continent to continent. Many of the smaller islands are interesting, but its not till the player begins traveling to the larger continents that the world begins to weave its rich tapestry. Major islands are themed as exotic locales, often taking inspiration from the cultures here on Earth. The Ixa’Taka Kingdom is reminiscent of an ancient Mayan civilization, Yafutoma Island resembles the far eastern cultures of Japan and China, the Nasr nation is made up of a desert-dwelling people living amongst dunes and sand-covered monoliths, and the Lands of Ice are, well, icy. The variety and dearth of content Overworks created is always engaging, and at times, astounding. It’s impossible to talk about the quality of Skies without mentioning the music. This game is widely regarded as having one of the strongest soundtracks of its era. A fully orchestral score brings the world to life, and every island has its own unique and wholly wonderful audible theme. The native drumming of Ixa’Taka, with its woody flutes and bongos stands out, as does the soulful, koto-laden themes of the Japan-inspired Yafutoma island. Each culture of the game is represented by a collection of strong and memorable songs. Sega Japan recognized this and released a limited CD soundtrack that can still be found on auction sites. In addition to a generally fantastic soundtrack, Overworks pushed to add audible innovation to Skies’ gameplay as well. One of the biggest technical advances of the game was what Sega referred to as “dynamic music”. Using this system the music would change dependent on how well the player was doing in a battle. 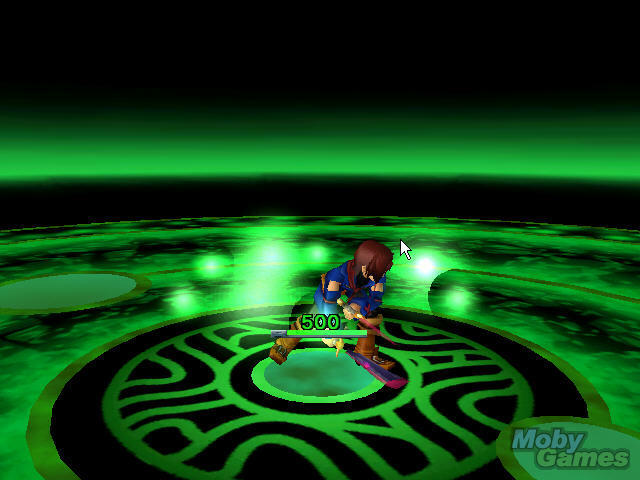 If the player’s HP dips dangerously low the battle theme changes to a stress-inducing raucous until the party is healed or defeated. If the player suddenly gains ground on his opponent the music rises to a triumphant crescendo. It’s implemented in a subtle way, and while this kind of thing may be commonplace today (2014), in 2000 it was quite a unique and inspired achievement. For years Sega fans have been eagerly awaiting news of a sequel or continuation of the Skies of Arcadia series. Rumors have come and gone, and Sega fans have become well accustomed to disappointment regarding older Sega intellectual property. While a true sequel has yet to be announced, Skies fans have enjoyed a bit of fan-service through other releases in Sega’s lineup. Inclusion in Sega and Sumo Digital’s wonderful All-Stars Racing series has exposed Vyse and Skies of Arcadia to a whole new generation of gamers, albeit only a limited exposure. Before this was the inclusion of the three main characters, Vyse, Aika, and Fina, as characters in the absolutely outstanding Valkyria Chronicles for Playstation 3. In VC, Vyse is known as “Vyse Inglebard” and operates as a shocktrooper. Aika is known as “Aika Thompson” and operates as a scout. And Fina, known as “Fina Sellers”, is a non-playable character operating as a medic. Seeing these characters in modern high definition is enough to bring back the long-dormant pains for a continuation of the series. 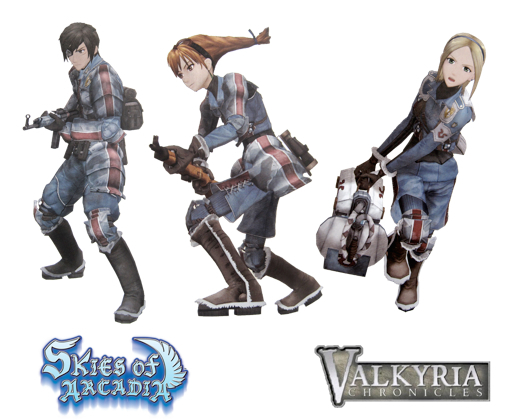 Vyse, Aika, and Fina were also included in Valkyria Chronicles 3 for the Playstation Portable, though that game remains a Japan exclusive. As time goes on the possibility of a Skies revival diminishes, especially considering that the last release in the series is even now a distant memory. Skies of Arcadia Legends was a Gamecube remake of the original, and is now more than twelve years old. This game featured small updates to the gameplay, including fewer random battles and the addition of new discoveries, rivals, and story lines. The Gamecube release is often said to have slightly better graphics and slightly worse sound quality than the Dreamcast original, though practically the difference on both counts is negligible. As an interesting side note and a bit of optimism for fans, Legends sold well enough to warrant a reprint in 2004, and the fan-base continues to be one of the most vocal in the Sega community. Even so, there hasn’t been a mainline Skies game released in over a decade, and a decade is a very long time out of the spotlight in the publicity-driven video game industry. Then again, the future isn’t totally bleak. Mere months ago Sega Sammy’s Chief Operating Officer Naoya Tsurumi said that the recent acquisition of Atlus by Sega will bring new and exciting possibilities to the company. Tsurumi has stated that Sega’s entire catalogue of intellectual property is open for Atlus, especially dormant IPs. He went on to state specifically that “With consideration towards Atlus’ strengths, Japanese RPGs would be a prime example.” So it’s not beyond the realm of possibility to think that an Atlus developed Skies game could be forthcoming, albeit years away. Couple this news with the perennial rumors of an HD remake for WiiU, Vita, and PS3/4 and the skies start to look bright indeed. Whether a sequel or remake comes or not, in the end, Skies of Arcadia will always be one of Sega’s greatest accomplishments. The people who made it set out to build a massive, technical world, dripping with remarkable visuals, inspiring music, and remarkably solid gameplay. This in itself would be a feat, especially in the year 2000, but what sets the game apart from the rest of the pack is that the team at Overworks created a place that you actually want to visit. They were able to create a world that’s rich and colorful, storied and wide-open; a world of positivity and adventure, where there’s no telling what awaits you just over the horizon (or in this case, just over the Dreamcast’s draw distance). For many of us, disposable time is scarce these days, and when we find the time to play a video game it’s important to find an enjoyable place in which to spend that time. Above all else, Skies of Arcadia is simply a great place to be.